The audio version of "The Dress" has hit the internet, and it's tearing it apart. Gus Rosendale reports. The audio version of "The Dress" has hit the internet, and it's tearing it apart. 'Yanny or Laurel' is the latest version of the illusion that had the world debating whether a photo of a dress was blue-and-black or white-and-gold...but this illusion is for the ears. Jimmy Fallon Asks: What Color is #TheDress? 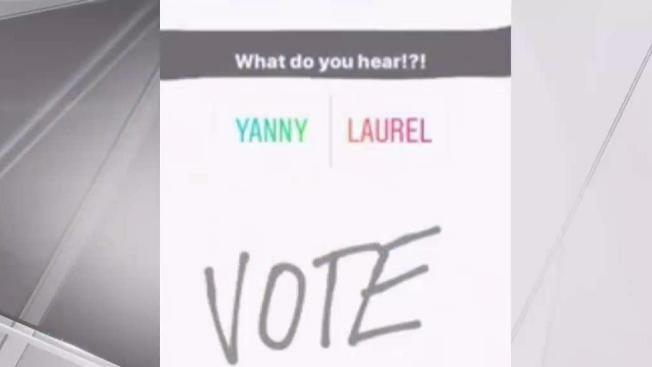 The audio of a robot saying either Yanny or Laurel was originally posted on Instagram by vlogger Cloe Feldman with the poll question, "What do you hear?." She also posted it to Twitter, and it turned out the question was so divisive it was soon picked up by Reddit and global media, went viral and became the hot topic in the workplace Wednesday morning. "Yanny....I listened 10 times and cant figure out how anyone hears laurel," said one typical Yanny-hearer on Twitter. "How are y’all hearing yanny? it clear as day says laurel," Devonte Wilson retorted. "They are saying they hear “yanny” because they want attention..." Domenic Z theorized. The debate had to be resolved, before relationships were fractured forever. Media outlets went to Brad Story, Professor of Speech, Language and Hearing at The University of Arizona to end the fight. He said multiple factors were at play. "Part of it involves the recording," he said. "It's not a very high quality. And that in itself allows there to be some ambiguity already." The quality of the speakers people listen on can also change what people here. To get to the bottom of the debate, Story ran an acoustic analysis on the audio clip. He also recorded himself saying both words. He concluded that the recording was most likely saying 'laurel,' however the words yanny and laurel follow "almost the same path" spectrographically. "If you have a low quality of recording, it's not surprising some people would confuse the second and third resonances flipped around, and hear Yanny instead of Laurel," he said. Just to add to the confusion, Story said that, if you change the pitch of the original recording, you can hear both words.